I have a couple of pumpkin pie milkshake recipes on here already, but I had to feature this Bourbon Pumpkin Pie Milkshake because I L-O-V-E how she served it! Of coures I love that the milkshake is served in a mason jar, but I really love the Halloween colored non perils that she used to decorate the glass. 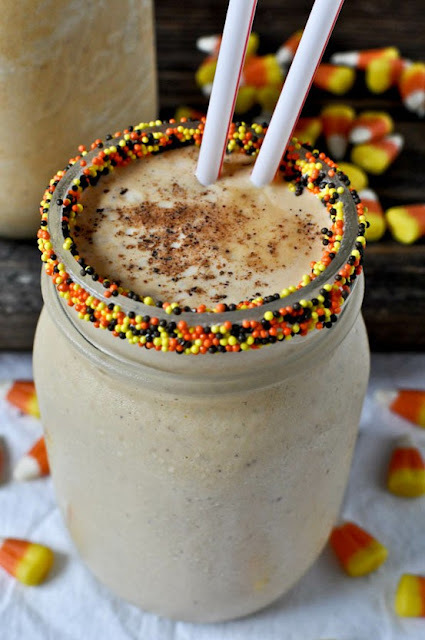 You can get the recipe for this adult pumpkin pie milkshake over on How Sweet It Is. And if you love the sprinkle rimmed glasses, you will want to check out the chocolate rimmed glasses and the pop rock rimmed glasses too.